As a file store grows, you might need to migrate the file store to a new location. During these instances, you can temporarily set the file store to read-only. For complete instructions on migrating a file store to a new location, please reference the Migrating One File Store Location to Another Location Knowledgebase article. It is important to note that the root stores will still be written to as root databases are modified, but no new databases will be created. Additionally, file stores will still be modified as files are purged and revisions are trimmed. However, no new data will be written to the file stores. On your server, navigate to C:\PostGreSQL9.1\bin\pgAdmin3. 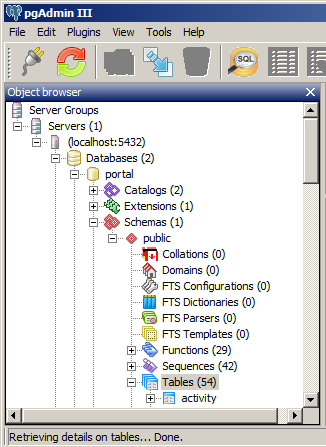 Using the Object Browser window, navigate to Servers > (localhost:5432) > Databases > portal > Schemas > public > Tables. In the status column, change the value to readonly.